Check out the Fair, crowd free! Everyone gets to see the fair once it has already opened, but how many people can say they got to explore the Topsfield Fair crowd free? Check out all your favorite spots as you run through the fair and along scenic Topsfield. Our race after party puts all other parties to shame. Our race after party puts all other parties to shame. After you finish, everyone is welcome for some food and music! Our after party is always a great atmosphere. Celebrate your finishing time with friends and family, while relaxing and listening to some live music! Everyone loves a good cause. Everyone loves a good cause. Did you know all the proceeds of the Topsfield Fair Road Race goes towards the Essex Agricultural Society’s Scholarship Fund? Your entry will give a senior in high school the opportunity to pursue their goal of a higher education. There’s nothing better than running and knowing you’re helping someone in need! The perfect way to kick off the Topsfield Fair! It’s the perfect way to kick off the Topsfield Fair! The Topsfield Fair Road Race is always the Sunday before the fair opens. It’s the perfect way to start kick off the start of the Topsfield Fair! Awesome chance to get active! This is an awesome chance to get active! Before the cold winter months come in and we all hibernate in our houses, enjoy a chance to get active! 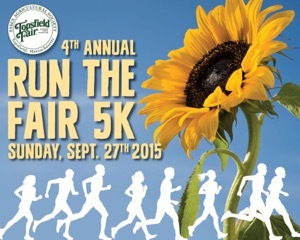 Start your run right as fall begins enjoying the beautiful Topsfield scenery and Topsfield Fair! The biggest way to get involved this year is by entering in our new exhibit categories made especially for this year’s theme! 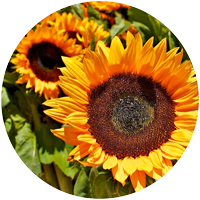 The Farm Photography Contest has added “Year of the Sunflower” categories for Youth and Adults. The Educational Department has added a special youth “Year of the Sunflower” poster contest as well. Adults have always been able to enter their sunflower plants into the fair, but this year only there will be a youth category as well! If you don’t have any sunflower seeds lying around, no worries! Youth can pick up special made sunflower kits at the Topsfield Fair! This Year the Topsfield fair is partnering with organizations to distribute out sunflower kits! We’re distributing these kits to 37 libraries across the North Shore, and have already distributed over 2,000 participants! You could say we’re pretty excited to see all those sunflowers come fair time! Each kit may contain any of the following; materials for each participant to start their own sunflower garden, supplies for a special sunflower craft, custom Year of the Sunflower Sticks, and/or Topsfield Fair Year of the Sunflower Activity Books! Tomorrow (March 8th), 100 local brides will flock to Coolidge Hall on the Topsfield Fairgrounds for the Essex Agricultural Society’s “Fairest of Them All” Bridal Expo. The Expo, which will be open from 11AM to 4PM, will be an event to remember, with a live DJ, lots of demonstrations, and food samples. We have a wonderful assortment of vendors for you to meet during the event. We are excited to have CoolCityEntertainment MC’ing the event, and two students from Revive Dance Xchange coming to demonstrate their wedding dance. You won’t leave hungry, with delicious samples from Cloverleaf Catering, Timothy S. Hopkins Catering, and New England Ice Lollies. Plus, Espresso Dave’s Cappuccino Catering has your caffeine fix covered, with free drink samples throughout the day. Amongst about 20 other vendors, Coolidge Hall Weddings staff will also be present to showcase our newly renovated wedding hall! In addition to interacting with vendors from across the state, attendees will also have the opportunity to take part in the Expo’s Bridal Passport – a drawing with hundreds of dollars in prizes up for grabs. A huge thanks is given to all of the vendors who provided prizes. One lucky attendee will win a free engagement shoot or $300 off wedding package, from Alisha Maria Photography. A lifetime lover of photography, Alisha opened Alisha Maria Photography to build a business surrounded by the things that make her truly happy in life; people, memories & love! Alisha is based out of Stoneham, MA, but serves the greater New England area. Amelia DiGregorio, a Peabody resident and realtor with Keller Williams Realty, will provide a $50 gift certificate to the Container Store. Amie specializes in helping newlyweds find their first home, and knows the gift certificate will be helpful for organizing the couple’s new home together! One winner will also receive $200 off wedding services booked with Jan Lorrey Flowers, of Newbury, MA. With over 30 years in the floral industry, each of Jan’s creations is infused with her love of flowers. The 2014 Topsfield Fair is proud to announce our newest sponsor, National Grid. They have a long standing tradition of supporting local events, and is committed to the communities they serve. National Grid is an electricity and gas company that networks their consumers to energy sources. In Northeast America alone, they connect more than 7 million gas and electric customers to necessary energy sources. They deliver electricity to about 3.3 million customers in Massachusetts, New York and Rhode Island. They serve around 3.4 million customers natural gas in Massachusetts, New York and Rhode Island, making them the largest distributor of natural gas in northeastern U.S. Not only branched in northeast U.S, they also serve Great Britain as well. National Grid delivers gas and electricity across the country. Currently, National Grid is dedicated to solving one of the greatest challenges our society faces; renewable and sustainable energy solutions. National grid supports the development of renewable energy by allowing consumers to participate in their GreenUp renewable energy program. Users can have the option to have all or part of their electricity generated from renewable resources, while continuing to keep National grid as their electricity supplier. The Topsfield Fair is excited to have National Grid at this year’s fair. We encourage everyone to check out their booth to find even more information! If you haven’t heard of Abbey D’Agostino, you will soon. The 22 year old Topsfield native already took Dartmouth college by storm and is now getting ready to take her talents to the national level. She is a passionate and fierce competitor, Abbey is easily the most decorated athlete in Darthmouth history. She is just beginning to start her professional running career with New Balance, as she begins competing against the top runners around the world. Her previous accomplishments include a 7 time national champion, the first woman to ever win both the 3k and 5k at National Indoors not once but twice in her career, and the first in her league to win the Cross Country National Championship. Abbey will be joining us this Sunday, September 28th for autographs after our annual Road Race! The race starts at 10AM and check in is at 8AM. Be sure to stop by and run, or stop by and cheer on our competitors and make sure to say hi to Abbey while you’re there! Show Us Your Best Cookie! Entries will be judged based on flavor, texture, appearance, and originality/creativity. First place wins a blue ribbon (for bragging rights), $40 (to buy more ingredients to make more of your delicious oatmeal cookies), and a Sundae a Month Certificate (because who doesn’t like free ice cream). To enter, your “parent” contestant must be over the age of 18, and your child must be between 6 and 17. This contest is for amateur bakers only. Unfortunately, professional bakers may not enter the cookie celebration. If you have more than one child, have no fear nobody has to be left out! You can enter a different cookie recipe with two different children, but not two different recipes under the same child. For more guidelines on how to enter, be sure to visit the exhibitor’s handbook which can be found on the Topsfield Fair website under Food Department! You can enter until October 9th at http://topsfieldfair.org/ehfood.php under Parent & Child Cookie Celebration Supported by Goodie’s Ice Cream! If you like running for a good cause, then we have great news for you! The Topsfield Fair Annual Road Race is back for another year! Join us on September 28th, at 8AM for check in and 10AM for race start! Every year the Essex Agricultural Society donates over $25,000 in scholarship money to rising seniors throughout Essex County. This greatly helps students with the growing cost of a college education. With your help, we want to donate even more this year to well-rounded students who greatly deserve the opportunity to continue their education. Even if you are not an avid runner, join us anyway! This road race is welcome to walkers and bikers as well as runners! You can sign up online at www.topsfieldfair.org, or by grabbing an entry form at the Topsfield Fair office.